Color(s): White with black, blue, tan red; solid or spotted. An extremely ancient and rare breed, the Peruvian Inca Orchid originated in Peru during A.D. 750. A gifted sight hound, this breed was highly prized by the Inca Indians. The Hairless variety was often looked upon with more favor and only kept as pets; the Coated variety were used as hunters. In the Peruvian Inca Orchid's native country they are referred to as "Perro sin Pelo del Peru", while in North America and portions of Europe they are called the Peruvian Inca Orchid. 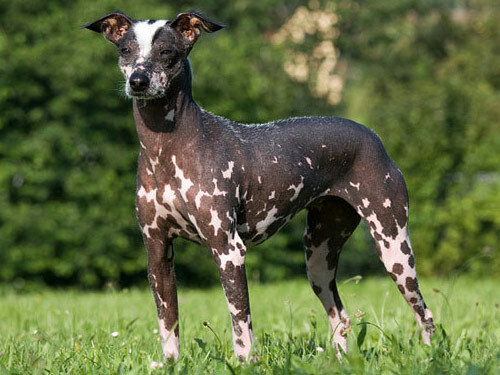 This breed is quite uncommon and difficult to acquire. An elegant, graceful, and slightly-built breed, the Peruvian Inca Orchid possesses strength, agility, and speed. They exhibit a noble demeanor and are "deer-like" in movement. The Peruvian Inca Orchid breed is not recommended for first time dog owners. They do best in a home with older considerate children and get along well with other dogs. They are not recommended for homes with non-canine pets. The Peruvian Inca Orchid are highly devoted, affectionate, and loving. This breed is extremely sensitive and fragile. They do not do well in the sun or in cold climates. Peruvian Inca Orchid's are very soft-tempered, but are reserved, distrustful, and wary of strangers. They are highly intelligent, obedient, fastidious, and willing to please. The Peruvian Inca Orchid is supple, lithe, agile, and quick. The Peruvian Inca Orchid breed is prone to early tooth loss. The skin of the Hairless variety must be kept protected at all times. It is important to not "overly-lotion" the skin as this makes the skin more prone to tearing, clogged pores, and acne. Special attention must be given to the ears to prevent dryiness and cracking. The Coated variety should be brushed when necessary. Bathing of both varieties should be done only when required using a mild shampoo. The Peruvian Inca Orchid comes in two varieties: Hairless and Coated. The Hairless variety may have a large amount of pink skin, or the skin may be fully colored. There may be very short hair on the tail, feet, and head. The Coated variety has a full body coat. The hair may be short, medium, or long in length. The Coated variety sheds little to no hair. Both varieties are odorless. Early socialization is required. Peruvian Inca Orchid's do not respond to harsh or heavy-handed methods. Training must be done with kindness and consistency. The Peruvian Inca Orchid is highly obedient and quick to learn. The Peruvian Inca Orchid breed is well suited for apartment living. Yards must be securely fenced with ample shade. They do not require an inordinate amount of exercise and a securely leashed daily walk will suffice. They thrive on spending time with their family and do best being kept indoors as much as possible.